Wallace Jefferson, chief justice of the Texas Supreme Court and the first African American to be appointed to the court, will make a President's Speaker Series presentation at 11 a.m. March 1 in the Beto Criminal Justice Center Killinger Auditorium. Jefferson graduated from high school in San Antonio in 1981 and attended Michigan State University, graduating with a degree in political philosophy in 1985. Three years later, he earned his law degree from the University of Texas School of Law. After working for the law firm of Groce, Locke and Hebdon, Jefferson formed his own firm in 1991. Crofts, Calloway and Jefferson became one of the most successful appellate practices in Texas. Jefferson has also argued and won two cases before the U.S. Supreme Court, which is considered quite an accomplishment since most lawyers never appear before the Supreme Court even once. While honing his expertise in appellate law, he also served as president of the San Antonio Bar Association and director of the San Antonio Public Library Foundation and the Alamo Area Big Brothers/Big Sisters organization. Jefferson has been named Outstanding Young Lawyer by the San Antonio Bar Association. In 1996 he was named a "40 Under 40 Rising Star" by the San Antonio Business Journal. In 2002 James Madison College at Michigan State University gave him their Distinguished Alumni Award. 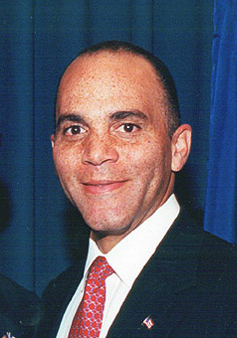 His appointment as chief justice of the Texas Supreme Court was named one of the "Good of 2004," by Black Entertainment Television, which said, "the great-great-grandson of a slave was named Chief Justice of the Supreme Court, making him the first black to preside over the state's highest court." University of Houston Law Center administrators are expected to attend Jefferson's speech. "There is a connection with his law background," said Paula Vernick, assistant to the SHSU president for special projects." Vernick said the invitation is a courtesy to SHSU's partners in a new program that combines a Ph.D. in Criminal Justice from Sam Houston State University with a J.D. in law from The University of Houston. Vernick said that the president's office invited Jefferson because "he is leading a successful personal and professional life and has overcome obstacles." The President's office looks for speakers whose lives are successful and whose stories are inspirational. The lecture series was created in 2002 and is supported by a grant from long-time SHSU benefactor Lu Ellen Gibbs. The series goal is to share the kind of education with students, faculty, staff, and the community that cannot be learned in a classroom. With speakers as varied as David Robinson, James Haley, and Debbie Fields, each speaker teaches students about their personal experiences with disappointments and eventual success through perseverance. Vernick said that another purpose of the President's Speaker Series is to appeal to students who are the first in their family to attend college. "All universities in Texas are faced with an alarming situation in retention and graduation rates of minority students," said Vernick. "Role models are very important. We believe this man has a story to tell for all students on campus." With each speaker sharing the individual stories of their lives, one thing Vernick has noticed is that all President's Speaker Series speakers have another common theme: though their lives have been complicated by adversity, they are also distinguished by the people who have helped them along the way. "They all have someone that they want to give credit to," she said. Students who wish to attend the presentation but have a class at that period should get permission from their professors, and slips will be available to document attendance.